As a Native American tribe from upstate New York campaigned against the Washington Redskins' name in D.C., Del. Eleanor Holmes Norton told NBC Washington's Chris Gordon that she believes someday the name will be relegated to "the dustbin of history." Holmes Norton spoke Monday at a symposium organized by the Oneida Indian Nation, which says "Redskins" is a racial slur. The tribe scheduled their symposium for the same day the 32 NFL team owners began gathering in D.C. for their own fall meeting, set for Tuesday at the Ritz-Carlton. Tribal leader Ray Halbritter says the meeting's time and place provided a great opportunity to bring more understanding to the issue of why the Redskins name is considered offensive by many people. "As a proud sponsor of the NFL, the Oneida Nation has a vested interest in the league being a unified force in communities throughout America," Halbritter said. "This name is not a unifying force. It's a divisive epithet." The Oneidas invited an NFL representative to be part of the symposium but didn't hear from the NFL or Washington team owner Dan Snyder. But the NFL has now scheduled a meeting with the Oneida Nation for Nov. 22 and issued a statement that reads, "We respect that people have differing views. It is important that we listen to all perspectives." The Oneidas are pushing for the Redskins to change their name as the team faces fresh waves of criticism over its name -- a fight that's now decades old. Over the weekend, President Barack Obama said he would be open to a name change if he were the team's owner. But the Redskins say the name is a tradition and nine out of 10 Native Americans weren't bothered by it. Halbritter opened the symposium Monday by thanking the president for his comments over the weekend. "As the first sitting president to speak out against the Washington team name, President Obama's comments over the weekend were nothing less than historic," he said. 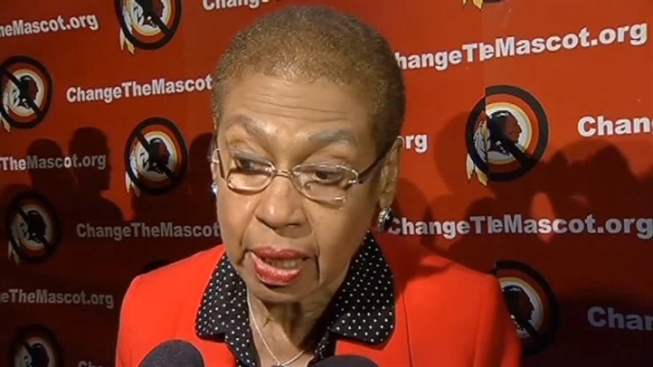 Holmes Norton said she believes it's only a matter of time before the name is changed. "We take names like this, put them in the dustbins of history and dispose of them. Understand why they were used at the time, and I think the name was used by our residents only because they identified the name of the team they love," Holmes Norton said. "They would love that team just as much if it had any other name, particularly if it didn't disparage anyone." In addition to Holmes Norton, other speakers included Kevin Gover, director of the Smithsonian's National Museum of the American Indian, and Rep. Betty McCollum (DFL-Minn.), co-chair of the Congressional Native American Caucus. Two Cooperstown, N.Y. teens who led an effort to change their school's team from the Cooperstown Redskins to the Cooperstown Hawkeyes were also scheduled to speak. The Oneidas say the issue isn't going to go away.